Подписка через RSS на "Термокамеры"
Thermal cameras, used for cooking and hot-smoking meat, fish, cheese and many other foods. 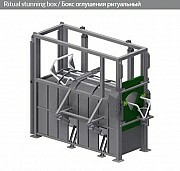 Meat-processing enterprise, wishing to buy a heat chamber, will receive a device with which it is possible to produce raw smoked, dried, as well as cooked smoked sausages, ham, various meat delicacies and similar products. The heat chamber is a heat-insulated cabinet for food processing. Heat chamber for smoking can work on different energy sources. Devices are gas, electric or steam. 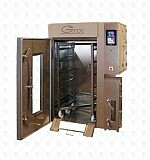 For small productions, a single-frame heat chamber for smoking will suffice, while large enterprises use multi-frame devices. The equipment is made of stainless steel and acid-resistant steel, which ensures their long operation. With the help of heating elements inside the heat chamber, the desired temperature is maintained. The heat treatment chamber has nozzles through which steam is released to maintain the level of humidity. In addition, heat chambers are equipped with smoke generators. Control the device using a computer, after laying in it the stages of the heat treatment cycle. The heat chamber purchased from our website, whether new or new, works according to a similar principle. After determining the type of procedure, the airflow exits the area where the products are processed, heading towards the ceiling. There, the air is moistened or heated and mixed with smoke or ordinary air, which is sent to the products. After cooking, the fans draw air through the blow nozzles located above the carts to load. Having bought a heat chamber in Kazan for your company, you can handle a wide variety of products.